Something new and exciting here at the Digital Art Teacher: I’ll now be offering Photography lessons! As part of these lessons, I’ll be adding new blog posts discussing what quality photography looks like and giving simple tips to help improve student photography. Photography, I think is an interesting art. I say this because anybody can do it, but not everybody has the patience it takes to actually learn how to see with a photographer’s eye. One of the first things I say to the kids who take my digital photography class is, “In this semester, I will be teaching you how to see." It’s actually harder than you might think. People (especially high school kids) take thousands of pictures a year. But a picture is not a piece of art until you actually visualize what the image will look like before you snap a shot. There is a difference between a snapshot and a quality photo. With these photo lessons, I hope to teach kids how to use their cameras (even the ones on their phones) for more than just selfies. I hope that they will be able to recognize a quality photo and be able take quality photos. Photos that are interesting to look at and tell a viewer a story without uttering a word. Besides, many artists aren’t very good with words anyway. The file below is a sneak peak to what is to come in these lessons. It's a famous photographer research project. Download it FREE! I will be adding new lessons every week for the next two months AND I will be writing a new blog post weekly discussing photo-taking tips for students (and teachers :) to use when taking pictures. Click here to “preorder” my digital photography curriculum for 30% off now! Read more about Introducing DIGITAL PHOTOGRAPHY lessons! The truth is that I was terrified of copyright, and I almost gave up the whole Digital Art Teacher idea all together. Ironic, isn't it? Since my latest blog post was all about copyright. Anyway, I found out that I had unintentionally broken copyright, and I pretty much ran away with my tail between my legs. Now I am trying to be much more careful, being aware of just how vast the realm of copyright extends. I am no expert, but below are some things that I learned through this process, I would hate for any of you to go through my heart ache and confusion. Identify your purpose. If you are using content for your classroom, you have the right to copy what you need for your lessons. As long as that content is made readily available (on the internet or any other form..if anybody uses other forms of information distribution anymore). If you are aiming to sell that content, things get a whole lot stickier. Don't be afraid to ask. This is my best piece of advice. If you are wanting to use a bit of someone else's work, but don't know if it would be ok, ASK! Most of the time, people don't care. Especially if you leave a link to their site somewhere. If they say no, no problem! The internet is so vast, surely you can find another solution to your problem. Those were the big points, hopefully that helps you at least clear the muddy waters of copyright at least a little bit. :) Here is a link to my blog post where I talk about how to find free images and another website that I find particularly helpful when looking deciphering what is under "fair use". So...now I am back online, selling my curriculum to anyone who needs them. I thank everyone who has already purchased from me, and if you have not purchased from me, I thank you for your interest. I am writing this blog post to demonstrate my honesty and to hopefully help you understand why I have been so absent. I believe that the lessons on my site are good and that they will simplify your life. I also want you to understand that I will do everything in my power to as original and transparent as possible. Have any questions for me about this journey? Send me an email, I'd love to chat! Do you have any questions about copyright, or just want to rant about it a little? Leave a comment below! Disclaimer: This is an old post. If you are interested in graphic design lessons, go to the "All Lessons" tab to preview my lesson resources. Thanks! It’s finally here!! I am proud to announce that my first set of lesson plans and video tutorials are now available! If you are interested in purchasing some graphic design lesson plans and video tutorials that will simplify the last half of the school year. Look no further, They’re HERE!!! Click this link to learn more about them. If you are interested but not willing to commit, sign up for my email list (below or in the sidebar) and receive 6 FREE graphic design tutorials and see for yourself the quality of my content. For those of you who pre-ordered, THANK YOU!!! Your content should be jailed to you by now and you should have access to all of this content (if not, let me know as soon as possible and I will get them to you.). I cannot guarantee that my lessons will make your classes run smoothly, but I CAN guarantee that they will save you HOURs of time researching and learning how to do a certain technique, or wondering what method would be best for a specific project, or how to explain a project or assignment. TRUST ME, I have been in your shoes and I remember what it was like to continually feel burned out and confused. Now is the time to take control and get the tools you need to be successful. Have some questions about the lessons? Contact me! Leave a comment! I'd love to chat with you! What is Copyright? - How to find FREE images! So what exactly is protected under copyright? Who owns a copyright? How does one get a copyright? You don’t have to have a doctorate in law studies to understand how copyright works, you just need to pay attention! The first thing you need to know is that everything that you create is copyright protected! Original works are protected the instant you finish them. if you take a selfie of yourself in front of the Eiffel Tower, protected! If you manipulate a photo you took in photoshop, protected! If you make a landscape out of Ketchup, Mustard, and Barbecue Sauce, protected! This is why whenever you look at Google images, every image has a caption that says, “images may be subject to copyright.” Unless an image has been given to a Royalty free website, it is technically copywritten. If you are looking for images that are free to use, you need to go to a website that posts "public domain" images like morguefile.com or public-domain-image.com. One thing that has been really handy for me lately is the “Search Tools" in Google Images. 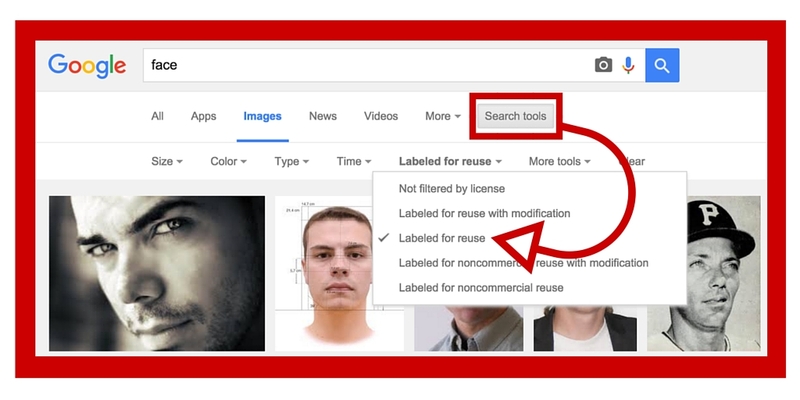 Once you click on that it allows you to select “Labeled for reuse.” This filters all the google images ones that have been labeled as public domain. This is AWESOME because now I don’t have to go to 20 different sites to find an image that perfectly fits my purpose, I can just go to Google! But more than just images are protected. There is also literary works, musical works, dramatic works, choreographic works, graphic design, sculptural works, motion pictures, sound recordings, and architectural works. The ingredients of the recipe are not copyrightable, but the instructions are. A standard calendar is not copyrightable. Anything distributed by the U.S. Government. Read more about What is Copyright? - How to find FREE images! Ahhh, Copyright. A vast sea of “grey area.” There is a lot of confusion when it comes to copyright. What is it? Who/what is protected? When can you copy something? Why can’t I use this image, but I can use that one? My first year teaching, I am ashamed to say that I taught this lesson by downloading a PowerPoint, reading through it one and a half times, and then groping through the lesson slide by slide, trying to ignore the blank stairs that I was receiving from students. Today, I actually enjoy teaching about copyright (insane, I know). I like the debates that inevitably crop up in class. I like clearing the muddy waters for them (or at least making the waters a little less murky). In the next few blog posts, I am going to wade through the copyright issue and hopefully give you at least an inkling of what it is all about. The first thing that we talk about is purpose; why do we have copyright in the first place? Answer? For the creator! The law allows for creators to have control over creations for a set period of time. If it is on the internet, it is free to use! The internet is a vast market place for everything from fine artowrk to exotic bird handling e-books! There are many resources that are free on the internet, but there are many more that are not! If there is no copyright notice, it is free to use! Under federal law, the creator need not post their copyright notice. So unless the item specifically says “public domain” or “free to use,” DON’T USE IT! If I change the image, I don’t need anyone’s permission! Adding a pig snout to a professional picture of Barak Obama is not necessarily going to transform the image enough in the eyes of the photographer to keep them from knowing that you used their image. Permission would be needed! If I don’t profit from it, it is free to use! It all goes back to the market. If my use of an image of Hilary Clinton hurts her chance of winning the election, you better believe that someone will be checking to make sure that the image I used was not taken without permission! If I only use part of the image, it is free to use! And this one is very similar to the previous one, I could take that picture of Hilary Clinton and obscure it so that only her eyes can be seen. But if someone recognizes that the photography was taken with out permission, I could be in big trouble! In the next few weeks we are going to dive head first into the infamous topic of copyright (fun!) and hopefully by the end of it you can at least recognize when you can and cannot use specific images or graphics. Do you have any questions about copyright? Is there anything that you just don’t understand? Write a comment below and I would LOVE to help you figure it out! Sometimes I forget about incorporating holidays into my lessons. I know at some schools celebrating holidays has been frowned on, but so far not at my school (cross your fingers, hope to die..). If you don’t remember until the day of, and you are feeling totally stressed and guilty because you didn’t get as much done as you wanted and kids aren’t enjoying your class as much as you hoped and you are behind in grading and… my advice is to STOP, have some chocolate, and pull the kids out of whatever you have them doing and play a game with them. It can even be an art game. I mentioned one that I like to do in a previous blog post. Don’t feel stressed about feeling the need to incorporate every holiday. YES, you are the art teacher. NO, you don’t need to feel guilty for the things you are too busy to do. Are there any tutorial website that you like? Let me know in the comments! Relax and rejuvenate before the coming semester! I hope that the semester has ended well for you. I am specifically thankful for those of you who have followed me through my digital adventure. I have so many plans for the new year, both for this site and for my classroom and I really hope that you will join me as I add more lessons and insight to this site. Be sure to do something FUN over break! I have been working like a dog over this last semester and I definitely need this reminder! If you are a workaholic make sure that you take some time off to BE with family or friends this holiday season. What I mean when I say that is don’t allow your worries about school to take you from the people you love this Christmas. Take at least a day and don’t allow yourself to think about anything related to work. When your mind drifts to school matters, pull yourself back to where you are and be present with your family. It is wonderful to be devoted to your job, but everyone needs to refuel. In fact you can take some of the stress off of yourself in the coming semester and purchase the 9-week lesson course and video tutorials that I have created for graphic design. I am very excited to announce that it will be available NEXT WEEK! This is your very last chance to get the pre-sale price ($19) for these lessons. But whatever you do, try not to stress. Worry only feeds fear, and neither of those emotions are any good for us! Now I was hoping that you could help me with something. I have created a survey that outlines what will be included in my lessons, but I want your feedback. Is what I have created what YOU would want? Should there be something added? Is there any part of them that you would never use? As I create more content and more lessons, I want to make sure that it will be something that will be beneficial to you. So PLEASE go to the survey and tell me your thoughts. I anxiously await your response! PS: Here is the link to the survey: https://www.surveymonkey.com/r/CWZ5WCS. And don’t forget that you can sign up to get FREE Adobe Illustrator Introduction video series by signing up for the email list below or in the side bar. Again, Merry Christmas! May God give you rest and contentment this fine holiday season! Read more about Relax and rejuvenate before the coming semester! The option bar is directly related to the object you have selected. It gives you…wait for it…options for the object. This is an easy one to understand. Just remember that it changes with the object you have selected and it will give you specific options based on what the object is. Again, this is a VERY QUICK outline for the tools. These are the things I wish I knew when I was getting started. If you want a more comprehensive rundown, check out my free Graphic Design in Illustrator introduction video tutorials. Did I leave anything out? Is there anything that is confusing you? Let me know in the comments below! 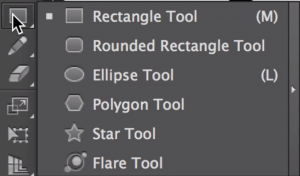 The tools panel is what controls everything you do in Illustrator. Just like you wouldn’t be able to use a hammer to screw in a screw, if you don’t have the right tool or don’t know how to use the right tool in Illustrator, you will be unable to do achieve the effect that you are looking for. Selection Tool (Black Arrow): This tool allows you to move things (objects, text boxes, or images) around and resize them. Pen Tool: Truth be told, this tool takes some practice to get it figured out. I plan to have a more in depth discussion on it at a later date. But basically, it is a very precise line tool. You can make curves or straight lines in one fail swoop! 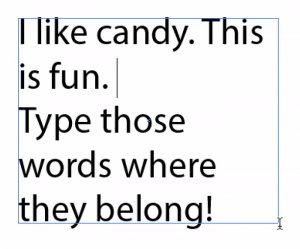 Type Tool: You guessed it…you type with it! You have two options when using the type tool, you can either single click and then your type will continue on one line forever. Or you can click and drag to make a box. If you do this then your type will stay inside the box you draw. 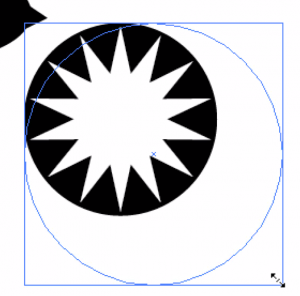 Shape Tool: There are a number of shapes that you can whip out in Illustrator. I am not going to get in to specifics here, but if you click and hold on the shape tool, you can see the default shapes. Once your shape is selected, just click and drag your curser to create your shape. 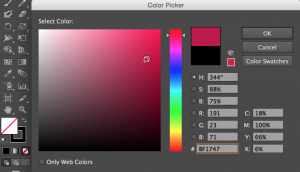 Color Picker: The color picker is important not only to select the color of the shape, but also to select the stroke (or outline) of the shape. Simply select the object you want to recolor, then double-click the color picker to change the color. If you double-click the solid box you will be changing the fill (or the inside of the shape) and if you double-click the box with a square cut out of the middle you will be changing the stroke (or outline). More Illustrator run-down to come next week! But in the mean time, what did you think? Did you think there are any tools I left out? For someone who has never used it, diving into Adobe Illustrator can seem like diving into the middle of the ocean without a life vest. Eventually, you just get tired of treading water and find yourself sinking. I vividly remember this feeling when I first began teaching design. I just didn’t want to do it anymore. Of course, quitting wasn’t really an option for me. I couldn’t just quit teaching in my 3rd week. So, I trudged through it and after making many, many mistakes, I found some good solutions to the problems that I came up with. I have been working on a video series called: “Learning Adobe Illustrator AND the Elements of Design”. In it I will be walking you (and/or your students) through the Illustrator program and exploring the elements of design. I will be releasing this video series at the NEXT WEEK (I'm pretty excited!). For now, however, I just wanted to briefly talk about WHY Adobe Illustrator is the best place to start when learning graphic design. It is what the experts use. It may not be the least expensive digital program on the market, but whenever I go to graphic design websites I constantly hear designers talking about using AI (Adobe Illustrator) and a starting platform. Especially when they are talking about logos or graphic posters. It is design friendly. Unlike Adobe Photoshop, Illustrator is forgiving when it comes to designing. If your line or shape isn’t exactly right, you don’t have to erase it completely, you just need to adjust it a little or rearrange your designs. It uses vectors instead of bitmaps. I won’t get into deep detail on the difference between the two, but a vector is preferable to a bitmap when it comes to design. A bitmap is basically a picture made up of thousands or millions of little colored squares, if you zoom in too far your details will look “pixelated” or blurry. Whereas a vector will never be distorted, no matter how much you enlarge the design. Again, I will be releasing a video series on Adobe Illustrator at the beginning of November. I really like to start my graphic design off right when it comes to these digital art programs and I feel that my video series will be a step in the right direction. Sign up for my newsletter! My video series will be out soon, be the first to try it!